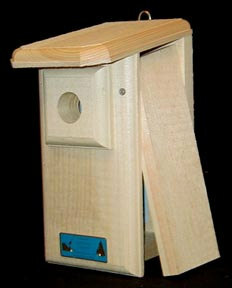 Needing a slightly larger chamber and entrance hole than their eastern counterpart, this house is ideal for the vivid Western Bluebird. RANGE: Breeds in throughout the West, north from western Alberta and southern British Columbia, south down the West Coast to Baja and east to eastern New Mexico and western Texas. Winters within most of the breeding range. HABITAT: Loves open woodlands and pastures.